More people are now talking about ways to subvert those constrictions of gender and the ways gender influences us but how we don’t necessarily need to be influenced by gender. That kind of conversation feels really relevant, with the timing of Sphinx coming out, in 2015, and its popularity, and people responding so well to it. People are interested in talking about these things, and I feel like it is the beginning of a pushing of these discussions into the realm of literature, or conversely, having these conversations because they are coming out of art and literature. I wonder—if this book had been translated back in 1986, would it have even had the same response? It is crazy to think how forward-thinking Garréta was, or how behind we all are, perhaps, maybe in our conversations. But yes, to me, it made sense for the book to come out now. MB: And since you did the majority of the translation in Paris, and Paris is like a character in the novel—at least a large part of the psychogeography of the novel is Paris—did the environment in which you physically translated the novel have any special influences on the translation? In contributing to your way of thinking about it, during the process? ER: Definitely. I think, not only being able to have access to Garréta, and talk to her, and get to know her, that obviously helped, and speaking the language obviously helped, but Paris itself being there was important. There is a whole scene in the novel where the narrator is talking about Café de Flore, and how much she hates it and all of these horrible people that go there, and I think it is different now because it is only tourists now who go there. But being able to go to that space, and sit there, and being able to be in the cafes that she was in, when she wrote the book—being able to inhabit the space of Paris in general. When I was translating the novel, I was working with Dan Gunn, who is a professor at The American University of Paris, where I was studying for my Masters in Cultural Translation. He kept saying to me, “You’ve got to go out to all these nightclubs. You’ve got to go find a place that is like the Apocryphe and really experience that.” But I am not a nightclub kind of person at all! It was so funny to me, because I went out a few times, but I don’t think I went to any places that would have really mirrored the Apocryphe. I definitely feel like there are all these scenes where she talks about the lights in the streets, views over the city, or when she is talking about walking down certain streets and she’s singing songs, and I feel like that kind of spirit of what she was talking about was definitely a little clearer in my mind thanks to actually being in Paris. Where does the novel’s classification as Oulipian situate in terms of the group’s literary history, particularly when you’re taking into consideration that it was published fourteen years before Garréta was actually an official member of the group? ER: When I first met with Garréta, she was very hesitant to ascribe the word—the label of “Oulipian” to this book. I actually met her for the first time in the company of Will Evans [founder of Deep Vellum Publishing], and he was discussing how he was going to market the book, why he was excited about it, and how it was the first novel by a female Oulipian to be translated. Garréta was wary of putting a lot of emphasis on that. She was very much like: “This book is radical and lesbian and feminist and queer before it is Oulipian.’” So it’s a little strange for all the focus to be on the Oulipian aspect, especially because she wasn’t in the group yet when she wrote it. But Sphinx definitely does follow in that lineage. There’s a very obvious constraint. It is simultaneously very high literature, a very high register of language, very serious literature, but it is also very playful the way that it distorts language and plays language against itself to make this point. I think she was definitely influenced by the Oulipo. Garréta was reading Oulipian works when she was growing up, so it’s not so far-fetched to say that of course it was influenced by that tradition. But in relation to the history of other writings of the group, what is really important for me as a distinction between Sphinx and other Oulipian works is its constraint. Most Oulipian works start out of a constraint and become an exploration of a linguistic feat for the sake of seeing where it leads, and what can come out of that constraint, as opposed to Sphinx, which was so clearly about a certain kind of point. And then figuring that out, “How can I make that point in my translation?”, and then making that point happen out of a constraint. So the novel is way more political, I would say, then other Oulipian works, and I think the political aspect of this book is more important to Garréta than the linguistic aspect or the aspect of Oulipian constraint. Her constraint is more incidental, as a way of hammering home the point that gender shouldn’t be an important factor in our identities and our lives and our relationships. It’s certainly not fair to say that there are no other Oulipian works that use constraint politically as a way of saying something deeper. But I don’t think any of the other Oulipian works really go as far as this book does. MB: The note of linguistic constraints brings me to my next question, which is the exact nature of the constraint that she uses. French contains grammatical gender, while English contains semantic gender. Could you get more specific for our readers, who may not be familiar with the rules and the finer characteristics of French? What did this mean in terms of the difficult decisions you had to make during the translation process? In your translator’s note, you mentioned maintaining Garréta’s subversion of the way gender works in the French language, and in human relationships, specifically in terms of how French verbs are gendered. ER: I can start by explaining the ways that gender came up in French, in the French text, that had to be avoided, such as adjectives or verbs that would reveal the gender of either of the two main characters. In French, if you use the passé composé, there are certain verbs that agree with the gender of the subject—like all the être [in English, “to be”] verbs, which are the most basic verbs; ‘to go,’ or, ‘to be,’ or whenever those agree with gender. So, when writing the novel, Garréta had to avoid certain verbs. Also, every adjective agrees with the subject, so Garréta could never say something like, “A*** was…” She can never actually say “A*** is black,” for example, because if you say directly A*** is black, you would say, “A*** est noire” or “noir,” adding an “e” at the end if A*** is a woman, or leaving out the “e” if A*** is a man. ER: Right. So there are all these little phrases where Garréta can’t just come out, and say, “A*** was black and I was white.” So, there are definitely small ways in my translation that you can see, “Huh, why would she have said it so indirectly?” and it is all coming out of this. Garréta couldn’t use this construction in French, and even though I could have used that construction in English, I’m translating the French, so I have to stick with what was written as opposed to making it more direct or more simple. It’s funny, because if you were to write a genderless novel in English from the first person, it doesn’t actually seem like it would be all that difficult, because the first-person narrator would have a really hard time revealing his or her gender just by speaking in the first person. We don’t have adjectives that agree, we don’t have verbs that agree, we don’t have that same kind of gender agreement structure. It gets really difficult because I’m translating a French text that avoids gender, and the way that French works, all the places where Garréta could kind of exploit the French language and get away with not using any gender, like by constantly talking about certain body parts. There are certain passages where it’s just the narrator looking at different body parts of A*** while A*** is sleeping or while A*** is dancing. Those are exactly the spots in English where you have to use gender. You can’t say like ‘an arm’, or ‘a leg’ it’s always ‘his’ arm or ‘her’ leg, and it starts to sound really awkward. MB: I have a sub-question to that, focusing on the passé simple. Sphinx’s narrator is stylised as a member of the intellectual, perhaps aristocratic, elite. In your translator note, you say, “I broke Garréta’s code by creating a new one, because writing with a constraint does not add up to being constrained by your writing.” The French passé simple is integral to the narrator’s identity. How did you re-code the text so that the tone registered the same way in English? ER: That’s sort of homage to Proust. There’s a lot of that kind of language with a really high register. In English, we don’t have the passé simple, which is obviously, just the literary tense in French. So, the only thing you can really do in English to make it really clear which register someone is speaking in. That someone is really intellectual, and clearly thinks very much of their intelligence, so in my translation it was necessary to elevate the register of the language as much as possible without it becoming too disassociated. Also, it was necessary to use phrases or references that would be used by someone who considers him- or herself to be an intellectual. At one point in my translation, I inserted a Shakespeare reference because it was talking about “the world is a stage,” or something to that effect. But that was me trying to put a little literary reference in there for English readers, because there are so many references to things in the French that are specific French literary references that I kept in English. They are still there in the English, but English readers might not pick up on them as much as French readers would. There are references to Flaubert and to Proust and to a whole smattering of French authors. There are references in there that I didn’t get immediately, and I studied French literature. So, I wanted there to be some little references like that in English to get that across, that this narrator is very intellectual and wants to show off. I used elevated vocabulary where I could, and I think that was where I struggled the most, which was writing in that kind of register, because I don’t write that way myself. And I don’t read a lot of books that are written that way either, so my biggest challenge was kind of wrapping my head around how to make that work without it sounding forced or awkward. One of my strategies for this was reading books that are written in a very high register, like Alan Hollinghurst, but that don’t obviously sound awkward. That was the biggest challenge for me. MB: To my mind, the narrator’s lack of gender creates striking juxtapositions with other necessarily gendered characters in the novel, especially in relation to the narrator’s mentor, a Spanish Jesuit priest, who leads him or her into Paris’ late-night underworld, but also in relation to the strange characters he or she meets in that world. As the narrator’s celebrity as a DJ grows, he or she assumes an uncanny role, like a confidante or comrade, to these characters. This passage ebbs and flows, like many others, with gender that is very much named and signified. Are these characters merely accessories in underscoring the narrator’s genderless identity, or is Garréta making a larger comment outside of the love story in focus, to which possibly the narrator is a vehicle? ER: I don’t know the real answer to this, or what Garréta would say to this, but my reading is two parts. When people first read this book in France, in 1986, there were many reviews that didn’t notice that the two main characters were genderless. I think that was the proof of the success of the book in a way, that Garréta was able to write this without people noticing because it shouldn’t really matter. The constraint is not what this book is about. It’s about a love story. And the point is that gender shouldn’t matter. So if you’re constantly noticing and trying to figure out what the genders are, you have sort of missed the point. To have these characters in a world that resembles the real world, and it doesn’t become this universe where nobody has gender, and you’re sort of wondering, like, “Huh, is this science fiction?” or, “What’s going on?” I think it would become a lot more obvious and draw a lot more attention to the constraint if the other characters were also genderless. Not that I don’t think Garréta couldn’t have risen to the challenge. I think that to put the two main characters in a real setting, and to have them in a world that everyone could relate to, and then they exist in this world, it shouldn’t really matter that they don’t have genders. It’s not really what the focus should be on. It is their love story, and I think it just grounds them in a real setting. There’s another passage where Garréta talks about this, when the narrator and A*** go to Germany, and the narrator talks about going into nightclubs, gay or straight, male or female: “I transgressed against all the boundaries. I went into all these places.” The important point is that there is this sort of reminder that we do live in this world of exclusions, and we do live in a world with boundaries. Also, these characters are able to exist outside of it, or without the influence of it on their relationship. Because, in this story, you necessarily can’t read into any of the problems A*** or the narrator have as being kind of gender-power relations, or for example, “A*** was being denied his or her voice because A*** is clearly a woman, because she doesn’t get to speak at all.” In the book, you can’t make sweeping statements like that, so all the problems that are present in their relationship have to be part of something else. They have to be separate from gender. I think that’s kind of the point, that we live in a world where there are just so many distinctions between people, and we are constantly drawing distinctions, but gender doesn’t have to be one of them. Perhaps Garréta’s point is reminding us what we’re facing everyday boundaries between us. There are always walls between us, but gender shouldn’t have to be something that has so much control over our lives. I think there needs to be that contrast, or the simultaneous reminder, that these boundaries do exist, and that gender does have an influence in our lives, but that it doesn’t need to. In this way, these two characters are the embodiment of escaping it. MB: I admit, and perhaps this makes me a bad reader, but when I was reading Sphinx a second time, I became a little bit of a snooping detective. I wanted to see if there were any indicators, or maybe cheeky clues, about either A***’s or the narrator’s gender. I think what struck me the most was when the narrator meets A***’s mother for the first time. I just expect that a mother would have some sort of attitude toward her daughter’s or son’s lover in a more gendered-protective way. ER: It’s funny you say that because to me there actually is a line in that passage that is, that could have been read as a clue. It gave me a lot of pause when I was translating. But then again, that was just me projecting onto the book. But that was the line in the scene for me, “Oh no, is this a clue?” And then I talked to people who had read the book, and they also didn’t construe that but pointed out the major indictors, like one character is white and one of is black, there’s a big age gap, etc. So, again, clearly it wasn’t a clue for you, clearly you were looking for clues and that line in particular didn’t jump out at you. Clearly I was reading too much into it. MB: That kind of brings me to this question. Were you able to maintain Garréta’s androgyny in your own mind while you were translating the novel? Again, perhaps this makes me a bad reader, but I’m really curious to know whether Garréta, even in her own mind, was able to do so. So, there’s no secret code to crack. There’s no little hints sprinkled throughout of what Garréta really had in mind. It’s not the point of this constraint being in this book, it’s that they are characters without gender. They exist in the real world, and clearly they do have genders, but they were constructed in Garréta’s mind as genderless characters or as characters written without gender markers. She said to me that there is no secret—that’s how they were written. For me, it is so hard. I had so many moments when I would be talking about this book, and even during my thesis dissertation, when I would slip up and use a gender pronoun in describing these characters. It was really hard for me to keep the androgyny in my mind, because they do feel like such real characters, and you want to assign them genders to better picture them. You’re reading a novel, and you want to relate to these characters, and they remind you of people you know, and they remind you of situations you’ve been in, and they are written so well that they come to life for you and therefore you need to assign them gender. So as I was translating, they definitely had genders in my mind. I think I was also influenced by the fact that I was talking to Garréta during the translation process, and I know that she is a DJ herself. MB: Garréta sounds like a fascinating woman. ER: Yes, she’s great. She’s a multifaceted, amazing woman. I knew a little bit of autobiographical information about her that made it really hard for me not to associate the character of this book with her. And knowing that she’s a lesbian, it started to make me associate A*** as being a woman. But most of the people I’ve talked to haven’t assumed that they were both women. MB: Is that reaction mostly from English-language readers of your translation? ER: Yes. I was surprised. I did an event in New York, around the time when the book came out in June, at Community Bookstore. Someone during the middle of the event raised their hand and made a comment about how they were so sure the narrator was a man, because it was a very male voice. And I was like, “What is that? What does that mean?’ What is a male voice? What are you even talking about?” I’ve had a lot of people say to me, “Oh, I definitely felt the narrator was a man.” Whether they thought A*** was a woman or a man has varied. To answer your question, no, I could not maintain the androgyny in my own head. Emma Ramadan is a literary translator based in Brooklyn. 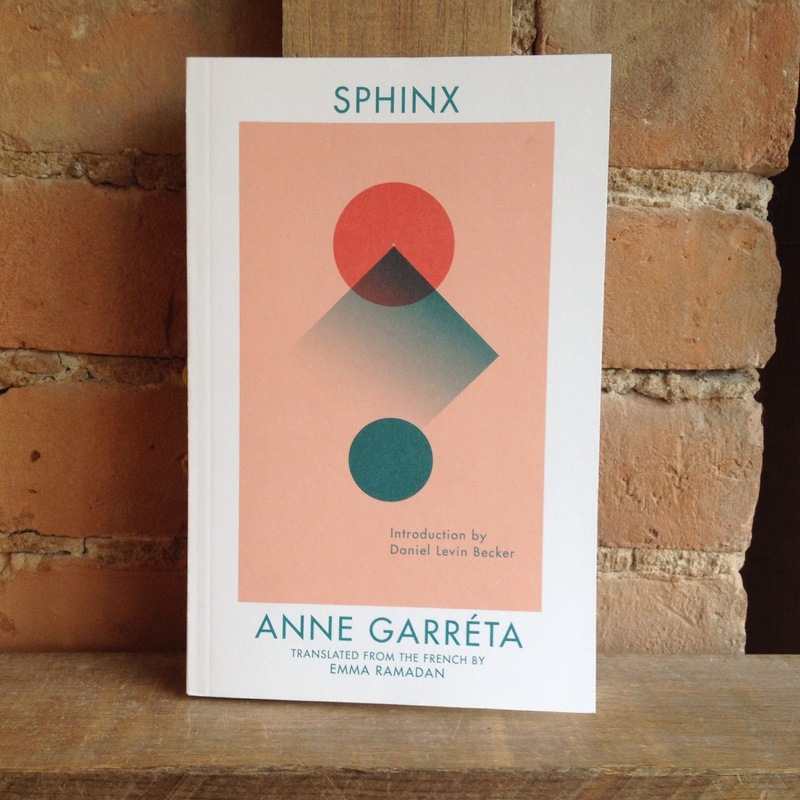 Deep Vellum published her translation of Anne Garréta’s Sphinx in 2015, and will publish her translation of Garréta’s Pas un jour (Not One Day) in 2016. She also translates poetry, including Anne Parian’s Monospace, recently published by La Presse (Fence Books), and is working on books by a number of Moroccan writers, with excerpts forthcoming in the Moroccan writing issue of Words Without Borders in March 2016.
i was quite surprised that neither of you mentioned the writer who seems the most obvious inspiration, directly or indirectly, for garréta’s interventions on gendered language. by the mid-1980s, monique wittig had published a number of novels in which she explored various parallel interventions. one works specifically with the first person singular, using “j/e” to defamiliarize it, others get into the territory around verb and adjective harmony that garréta seems to focus on. i’m eager to read garréta’s work, and thrilled that it’s been translated. but i wish the interview would have addressed the relationship between this novel and the other innovative “radical and lesbian and feminist and queer” writing that provided its actual context (of writing and of reading), rather than straining for a tenuous (if fashionable) connection to Oulipo. an examination of the differences and harmonies between wittig and garréta’s formal strategies – and those of other radical lesbian writers of the period – would surely tell us far more that’s interesting about this novel, its politics, its linguistics, and its importance than its author’s later connection to an avantgarde old boy’s club.